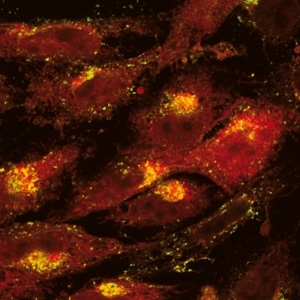 The Fluorescence Microscope Zeiss Axiovert 200 is equipped with an Axiocam MRm camera and filters for Cy5, Rhodamine, EGFP and DAPI. In the BZH, researchers have access to a Zeiss LSM 510 META spectral imaging confocal laser scanning system. The system can be used for 3-D reconstruction and time-lapse, FLIP, FRAP, FRET and linear unmixing. It permits the precise separation of fluorochromes with highly overlapping emission spectra. Up to 32 channels can be acquired simultaneously in 1,2 seconds. The Olympus CellR Imaging Station (resources of SFB 638) enables fast 3D multicolor time-lapse fluorescence microscopy. The microscope is fully automated and is equipped with a piezo for all objectives, automated Z-stage, an emission filter wheel and a sensitive ORCA/ER cooled CCD camera.